Memories of an Ex-servifan -Redd Boggs I was in the Army three years, five months, and one week. During that time, I became acquainted with men and women in uniform from all states except Nevada and New Hampshire, talked with Allied (and Axis) soldiers hailing from everywhere in the world from Bombay to Braunschweig and points between, and met civilians of both sexes in seven foreing countries -- but during my entire Army service I never saw, heard, or smelled a single science-fiction fan. For two months at North Pickenhem, England, as a member of the old 492nd Bomb Group, I was assigned as a Squadron Operations Clerk. Worst part of this otherwise pleasant job was pulling Night Charge of Quarters duty every fourth day. Posted merely on a whim of the Squadron Commander, the CQ's duties were few. Not till briefing time for the day's mission -- about 2 o'clock in the morning -- did things begin to hum. The rest of the time was a bore. Imprisioned between bare walls, a tight dull world consisting of three tables, a typewrite, a telephone, Pilot's Information Files, and a dogeared, torn World Almanac! Having regaled myself with a PIF and the Almanac on previous nights, one particular evening, in something reasonably resembling a flash, to write a fantasy story! Our typewrite was an English-made L.C.Smith, and every third key stuck but I struggled for three hours, trying to pour my ideas, naked and only vaguely arranged, onto the paper. Actually I was surprised when I realized, in the wee hours of the morning, that I had actually written a story. I finished the yarn just before Charlie Vergos, the Gunnery Officer, rushed into the office for his pre-briefing poopsheet. A few days latter, having decided to mail the story home, I took the manuscript to Group Intelligence to have it censored. Captain Goodhue, S-2 himself, read it over. "Did you write this?" ha asked. I admitted as much. "Pretty good", he remarked musingly. To make a long story short, on the strength of that fantasy yarn (which I titled "The Eternal Goldbrinck") I was transferred from Squadron Operations to Group S-2 as Public Ralations man. I operated in that capacity for the next thirteen months. "The Eternal Goldbrick" has never been published. Some day, perhaps, I'll send it to a fanzine. It's a fairly good story. One simmery day in June 1943 I visited Cuidad Juarez, Mexico, that glorified red-light district across the border from El Paso. 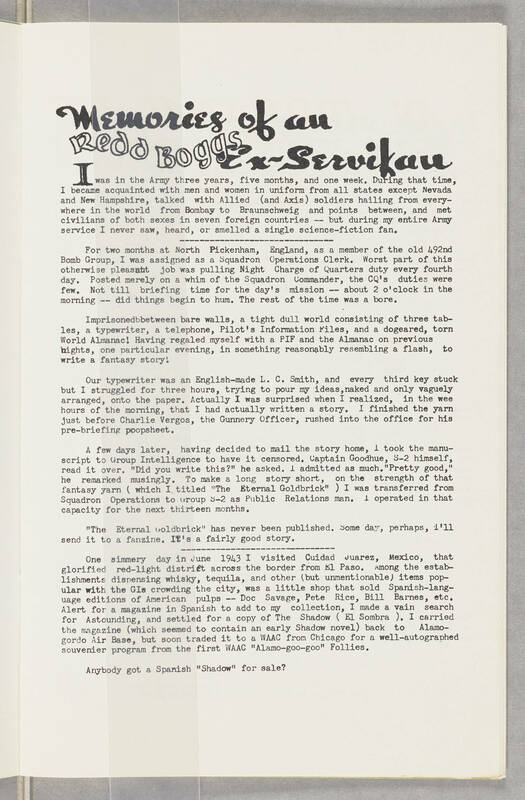 Among the establishments dispensing whisky, tequila, and other (but unmentionable) items popular with the GIs crowding the city, was a little shop that sold Spanish-language editions of American pulps -- Doc Savage, Pete, Rice, Bill Barnes, etc. Alert for a magazine in Spanish to add to my collection, I made a vain search for Astounding, and settled for a copy of The Shadow (El Sombra). I carried the magazine (which seemed to contain an early Shadow novel) back to Alamogordo Air Base, but soon traded it to a WAAC from Chicago for a well-autographed souvenier program from the first WAAC "Alamo-goo-goo" Follies. Anybody got a Spanish "Shadow" for sale?